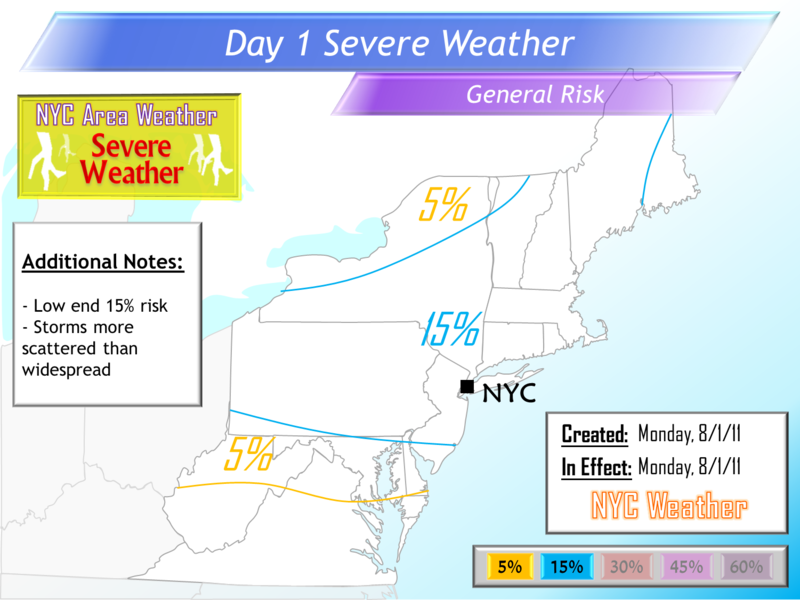 This morning’s update mainly discusses the severe weather risk for today and Wednesday’s potential heavy rain event. 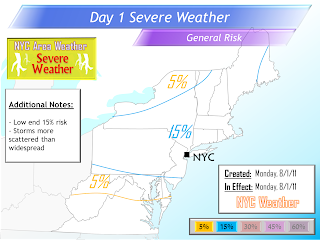 The rest of the pages will be updated throughout this afternoon and tomorrow morning, while storm updates will be posted this afternoon covering the severe weather event expected to affect parts of the area. Last night, the brief update mentioned that there have been major changes in the forecast. Until July 29, last Friday, a low pressure in Canada was expected to move from west to east, staying well north of Maine, bringing a very weak cold front into the northern parts of the region followed by another significant warm up. Since then, however, changes began to take place with the set up, and the low pressure in Canada is currently drifting southeast towards Maine, bringing a stronger cold front through the area today. Not only did this change add a risk of severe storms today and decrease forecast temperatures this week, but this change will also result in heavy thunderstorms moving through parts of the area on Wednesday. Set Up: A cut off low pressure will drift southeast towards Maine today, which will bring a cold front through the region. The cold front will move through tonight, which puts the best risk of thunderstorms for this afternoon and evening hours. There is a lot of instability, with LI up to -8 and CAPE up to 3000. These factors alone can support some severe storms, but other factors are needed for there to be a severe weather outbreak as well. Mid level lapse rates are supportive, getting as high as 6.5 to 7, which is supportive of severe weather. Even though the parameters above are favorable, there is very little bulk shear, and high bulk shear is an important ingredient for a severe weather outbreak. Forecast: The parameters previously mentioned are expected to support some severe weather activity across the region, including the area, but the storms are expected to be more scattered, unlike Friday when the storms were more widespread. Storms are expected to affect the area from at least 2-3 PM through the evening hours, especially affecting places from NYC and further north/west. The storms will be scattered, however, and parts of the area may fail to see storms as a result. No tornado risk is expected from today’s storms, but gusty winds and hail are risks from today’s storms. If needed, storm updates will be posted starting at 4 PM this afternoon. The cut off low is expected to reach Maine on Tuesday, and become stationary while the surface low pressure begins to weaken. With the cold front to the south of the area, dry conditions are expected along with partly sunny skies. Temperatures will be slightly cooler due to the front, reaching the upper 80s to lower 90s from NYC and further west and the mid to upper 80s east of NYC with a NW wind expected. Set Up: The forecast then gets more complicated by Wednesday. A MCS, Mesoscale Convective System, is expected to be located over northern Michigan on Tuesday evening, producing heavy rain/thunder in central/northern Michigan and strong to severe storms from central Michigan into Ohio. The upper level low will still be stuck over Maine, and as a result, the MCS will be forced to move southeast and around the low. Most models are still showing a wide range of possibilities, with the MCS either tracking north of NYC, over NYC, over central/southern NJ, or as far south as central Virginia on the ECMWF. Looking at the 500 mb height map, the NAM and GFS models seem to track the MCS along the 576/582 dm height lines, which would take the MCS from northwestern Pennsylvania towards central/southern New Jersey. With the track mentioned above, the MCS would move into the region tomorrow night. Heavy rain/thunder to the north of the MCS will extend further east, and a narrow band of heavy rainfall north of the low pressure is expected. At this time, there is uncertainty with the exact location, but the heavy rain can end up from the NY/PA border towards central/northern New Jersey. Due to the uncertainty, I placed a big area of heavy rain potential, but in reality, the heavy rain band is expected to end up more narrow than the map to the left shows. 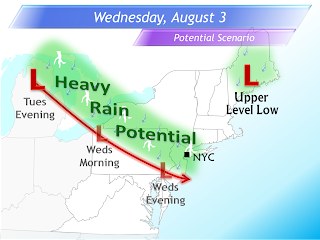 Forecast: The heavy rain would move into New Jersey in the early morning hours and leave by the late morning hours. Places under the heavy rain band could see amounts locally up to 2-3 inches, which could result in some flooding, and gusty winds are possible as well. 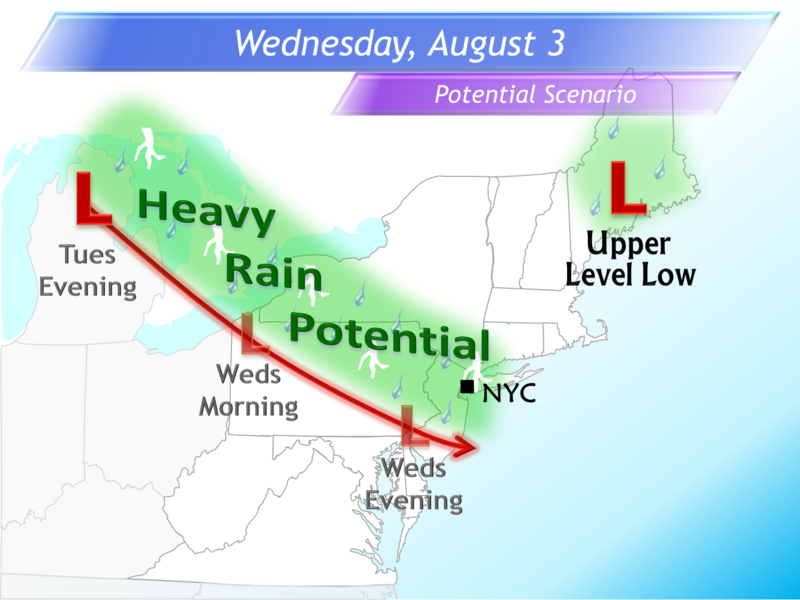 It is possible that the entire area misses the heavy rain, but due to the uncertainty, at this time northern New Jersey and NYC have a better risk of seeing heavy rain, and eastern Long Island/SE Connecticut are the most likely to stay mostly dry. Most of the rain would then end by the early afternoon hours, and as the low pressure is expected to stay south of the area, the severe weather would stay to the south as well, and temperatures would be more chilly, only warming up into the upper 70s to lower 80s in northern NJ with humid conditions. The scenario mentioned above would verify should the storm follow my current expectation. This is not a high confidence forecast, however, and the heavy rain axis could shift either north or south. Should it shift south, temperatures would be warmer, in the mid 80s, but there would be only light rain at most. Should the track shift north, there will still be heavy rain in the morning, but it would affect a bigger part of the area, and there could be some instability as well bringing a risk of strong thunderstorms along and south of Interstate 80. Stay tuned for more information on Wednesday’s potential rain event and how it may affect the area. Temperatures will warm up for the late week, reaching the mid to upper 80s from NYC and further west and the lower to mid 80s in Long Island and southern Connecticut. Dry conditions are expected on both days. Uncertainty returns into the forecast by next weekend, however, as some models show another heavy rain event while others fail to show anything significant. This is still in the longer range, and there is too much uncertainty to nail down the exact scenario. More information will be posted on the weekend rain potential over the next few days. Invest 91L has become more organized as of this morning, but there continues to be uncertainty with when 91L develops, and where it tracks, with the potential track ranging from the Bahamas to the Gulf of Mexico. Should the storm approach the SE coast, however, it is not expected to move up the East Coast, as due to the -NAO pattern and trough over the NE US, any storm that should reach the SE US should recurve out to sea instead of move up the coast. The Tropics page will be updated later today with more information on 91L, and the Long Range Outlooks page will be updated tomorrow with an update on the hurricane season and a general August outlook.